I was born and raised in Mexico City and have a bachelors degree in Communications from Universidad Anáhuac. I worked as a creative in advertising right after finishing high school and moved to New York City in 1998 where I worked at various advertising agencies that specialized in targeting the U.S. Hispanic market. At the same time, I was studying at the Parsons School in which I earned a degree in Graphic Design. I also entered other CE graphic design programs at various schools in NYC including the School of Visual Arts and Cooper Union. After becoming a Mom, I quit my job but continued to work as a visual artist. In 2008, I first discovered my passion for drawing and painting. Since then, I have worked with live models helping me to expand my knowledge of anatomical drawing and figure painting. 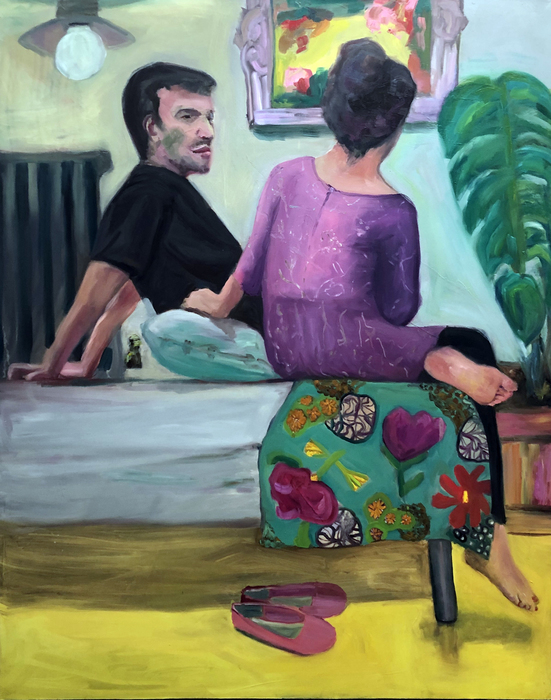 After my first year of studies for a Masters Degree in Figurative Painting (2015-2016) at the New York Academy of Art, I have been preparing my self-directed body of work that represents my artistic interest, my personality and contributes to creating social awareness. I have exhibited my paintings in the U.S.A. in over 30 groups shows including several Galleries in Manhattan, Brooklyn, Long Island, Poughkeepsie, California, and Philadelphia as well as in Sotheby’s Auction House in NY and various museums like the Attleboro Arts Museum in Massachusetts and the New Britain Museum of America Art. I had one Solo Show in NYC and have participated in more than five group shows in Mexico City and Puebla, Mexico. I have also been teaching young girls—from middle school to high school—with drawing in a private setting. In 2015, I received “The Award of Excellence” from Huntington Arts Council. In 2017, I was given an “Honorable Mention Award” by the Barrett Art Center at the Circle Foundation for the Arts as well as the prize for second place at the Brooklyn Waterfront Artists Coalition. In 2018, I was given “The Passion Project Award” and “Artdex Award.” I am a member of the American Federation of the Arts and most Museums in New York. 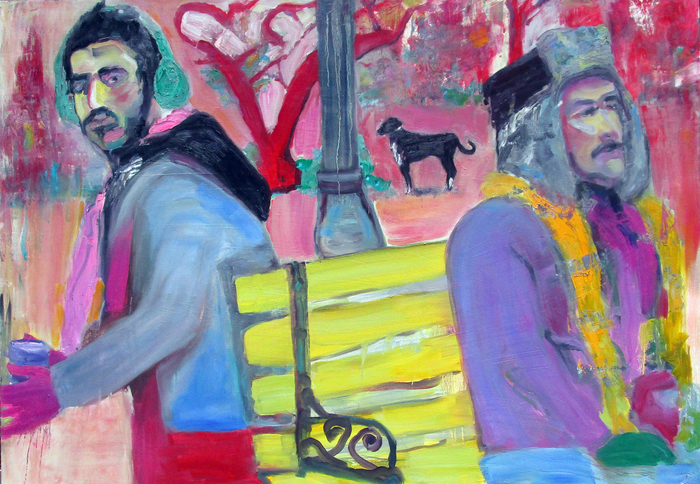 Jessica Alazraki’s figurative portraits convey everyday stories of colorful characters. These are confronting the viewer, without interacting with each other, instead submerged in their own personal psyche. 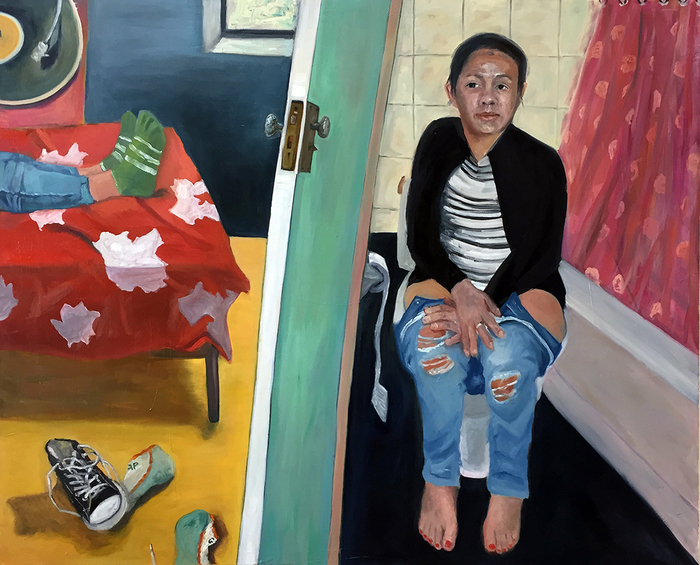 The narratives are based in ordinary and familiar scenes of Latino family life, highlighting the influence of American culture and implying indirect political statements. The strong presence of primitive and naïve style connects the works to folklore elements and Mexican crafts. 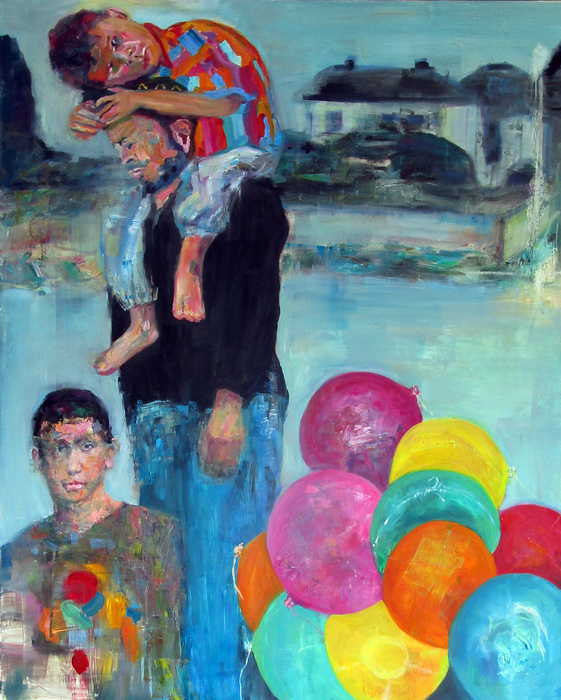 Composition and color are prominent in the paintings, as the artist opts for the placement of the elements versus the realistic quality of the form. Her intention is to break traditional viewing rules and come up with unpredictable pictures. Laws of perspectives and anatomy are altered thus creating distortions and exaggerations and ultimately prioritizing emotion over objective reality. Humor, nostalgia, patterns and decorative elements play an important role in the compositions. The light source is not clear, nor consistent, and color enters the paintings in radical, aggressive ways delivering emotion. Within the representational figures, abstracted forms appear. 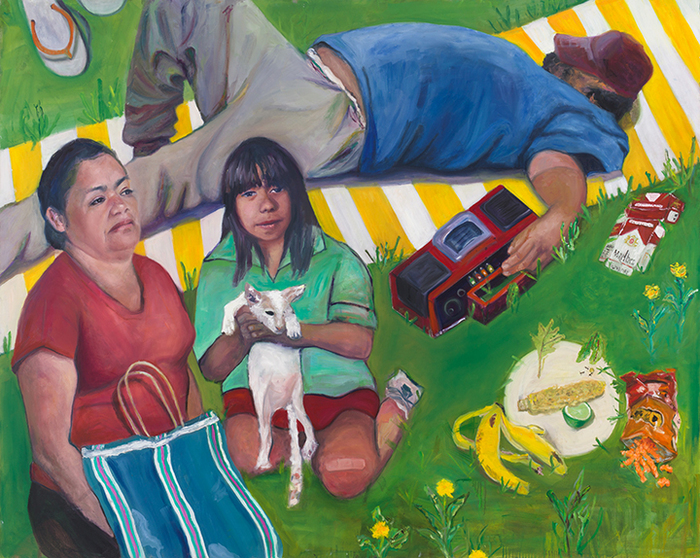 This subtle abstraction brings forth the social condition of the Latino, both defined and abstracted in the US. I am originally from Mexico City, based in NY. My experience as an immigrant and the relationship with Latino culture is the reason why I paint this kind of pictures. This beautiful, expressive portrait done from photographic references has a very contemporary style. Painted with oil on a big canvas surface, it's not stretched, but with your frame choice, it will create a colorful, fun and wired image that will make you smile every time you look at it.